Imagine you posted a picture online of your Mobile phone. Humans might describe it as "Samsung smartphone", "Black colored with latest Model" and so on. On the other hand, how search engines understand the photo you have uploaded? How do you make search engines to understand that photo? Here, only SEO, which will give clues to search engines to understand the photo by adding title and alt tags in that pic. After knowing the importance of SEO, mostly webmasters want to rank their blog on the first page of SERP's. But it's not an easy job to rank on first page of search engine result pages, especially on major search engines like Google without SEO. But we can make it possible with the smart and right use of Search engine optimization. In this post I am not going to write in deeply about SEO, but mention only some SEO tips, which would help you to rank your blog and page on 1st page of Google within a week. Before proceeding for that Five SEO tips, I recommend to do some study on the keyword or posts, for which you want to rank in Google. Search for the keyword on which you want to ran your blog or page. Visit that page and check the length of the article, keywords and tags used by them. To check you can explore their source code by pressing 'Ctrl+U' from your keyboard or by right clicking of mouse and then 'View Source Code'. Do this only for getting ideas to compete your competitors, not to copy their tags. Copying others article is unethical and illegal. If you do so, it may create a big problem for you in future. Your post title should not be more than 66 character. Because in google search result pages, it shows only first 60 characters of title. If your title is long then users will not take interest in your post, as it does not clear the ideas for which you have written your post. According to some experts, using numerical digits in title performs well as compared to tiles without numerical digits. Title should be attractive. Titles with little suspense is considered good, as it creates excitement in readers to know the facts in details. Descriptions should be in the limit of 150 characters. Mention keywords in description to make it more search friendly. Always give the genuine descriptions, don't try to do spam by adding only keywords. If you do so, it will be considered as keyword stuffing. Articles should not less than 400 words. Blogger.com users can count their words by using microsoft word, as there is no option for blogger.com users to count their article words. If you are a wordpress user then don't worry, they count words automatically. Articles with 800 words with at least 1-2 images is best for SEO. Don't forget to give title and add alt tags in images. Fetch as google is one of my favourite tools in SEO. It will ask Google to index your page immediately once your page has published. Login to your Google webmaster tools, and expand 'Crawl' menu, there you will find 'Fetch as Google'. Open that link and submit the URL of your newly published article. Click on fetch and in next step click on submit to index. For new users they will provide 500 submissions every month for free. on-page optimization refers to factors that have an effect on your Web site or Web page listing in natural search results. These factors are controlled by you or by coding on your page. Examples of on-page optimization include actual HTML code, meta tags, keyword placement and keyword density. Off page SEOoptimization refers to building links, promotion of post on social sites like Facebook, twitter, pinterest, tumblr, reddit, linkedin and others. 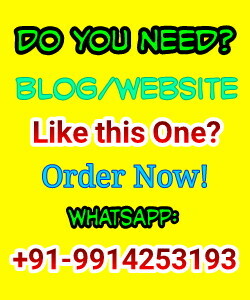 Now almost you have done the steps essential to rank on first page on Google. If your content is unique then you might be rank in google within 7 days. Generally, google bots take a lot of time to index your page, but fetch as google will solve your that problem. Also don't try to use Robots tags, if you don't have complete knowledge about them. Wrong use of robots tags put bad effect on SERP's. Don't copy articles and never do article spinning. Sometimes SEO is considered as unethical by some experts, only if we use black hat SEO techniques. But here the steps mentioned above are the part of white hat SEO. So, you can use above given techniques to ran your blog and pages in search engines. Message: I hope that you have enjoyed '5 Basic SEO Tips to Rank Your Blog on First Page' article. However, if you want me to deliver more items, then please share my post. You can use Social Sharing Widget provided at the end of every post. After all, Sharing is Caring! Welcome. 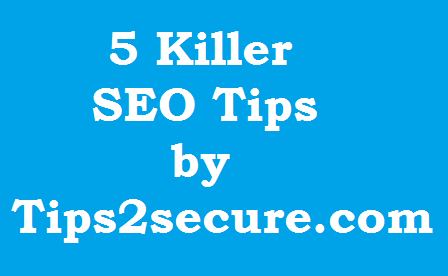 And stay updated with tips2secure to get more awesome updates on SEO and Blogging. Nice article. It gives a boot that we can improve Ranking. Hmmm... But avoid spam or unethical activities while applying above given steps. Why you are repeating the same comment?? Hmmmm, how are these killer tips? These are basic tips not "killer" tips IMO. Hello, I respect your comment and I also feel that title does not seem good, that's why I have changed the title of the post. Edit Made: Word 'Killer Tips' has been replaced by 'Basic Tips'. We always care and love our users opinions and suggestions. Wow... well written and informative. Your every SEO tip is useful and can be easily applied. Keep it up and keep sharing your knowledge. I am glad you liked it and also thanks a lot for your appreciation. I’ve enjoyed reading this post. Yeah, I’m following most of the tips which you’ve revealed here.. The best way tp promote your blog is its well written article. This is the reason why article writing services are bexoming popular among students. I think meta title and description are very crucial point for better SEO. Thanks for writing about 'Fetch as Google'. Great Informative post. My wife is a blogger.Nowadays she is trying to learn SEO. She is a mad fan of your writing. She bookmark this lovely post. Thanks for sharing this helpful article. Building a website that can be found by your potential customers is a daunting task. There are many pitfalls, but you can avoid these and get rich rewards. This is the first in a 3 part series of articles looking at Search Engine Optimization. Part one deals with the 'off page' factors. Thanks for this informative post. This instructive post will not only be helpful for beginners, but for experts also. Really informative and useful stuff. Thanks for providing tips and tricks.I'll surely follow these tips and tricks to get more traffic on our website. Thank for visible information to bring our blog on the first page and attract online visitors. SEO has been changing so often. Knowing the latest things is always a high benefits to stay advanced in search engine ranking. I believe by following these tips people can rank their site better. I am a new blogger. Recently i make new website with blogger. But i don"t know how to earn visitor. And how to do seo for a bolg site. Then i read your post and i got the best seo guide for my website. Thanks a lot!! !